Mesothelioma is a rare form of cancer in which malignant (cancerous) cells are found in the mesothelium, a protective sac that covers most of the body's internal organs. The incidence of malignant peritoneal mesothelioma (MPM) is approximately 2 to 2.6 cases per million annually. Most people who develop mesothelioma have worked on jobs where they inhaled asbestos particles. The mesothelium is a membrane that covers and protects most of the internal organs of the body. It is composed of two layers of cells: One layer immediately surrounds the organ; the other forms a sac around it. The mesothelium produces a lubricating fluid that is released between these layers, allowing moving organs (such as the beating heart and the expanding and contracting lungs) to glide easily against adjacent structures. The mesothelium has different names, depending on its location in the body. The peritoneum is the mesothelial tissue that covers most of the organs in the abdominal cavity. Although reported incidence rates have increased in the past twenty years, mesothelioma is still a relatively rare cancer. 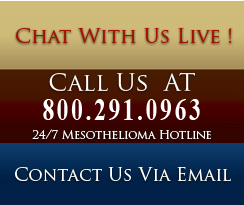 About 2,000 new cases of mesothelioma are diagnosed in the United States each year. Mesothelioma occurs more often in men than in women and risk increases with age, but this disease can appear in either men or women at any age. Symptoms of peritoneal mesothelioma include weight loss, and abdominal pain and swelling due to a buildup of fluid (effusion) in the abdomen. Other symptoms may include bowel obstruction, blood clotting abnormalities, anemia, and fever. If the cancer has spread beyond the mesothelium to other parts of the body, symptoms may include pain, trouble swallowing, or swelling of the neck or face. Diagnosing mesothelioma is often difficult because the symptoms are similar to those of a number of other conditions. Diagnosis begins with a review of the patient's medical history, including any history of asbestos exposure. A complete physical examination may be performed, including x-rays of the chest or abdomen. A CT (or CAT) scan or an MRI may also be useful. A CT scan is a series of detailed pictures of areas inside the body created by a computer linked to an x-ray machine. In an MRI, a powerful magnet linked to a computer is used to make detailed pictures of areas inside the body. These pictures are viewed on a monitor and can also be printed. A biopsy is needed to confirm a diagnosis of mesothelioma. In a biopsy, a surgeon or a medical oncologist (a doctor who specializes in diagnosing and treating cancer) removes a sample of tissue for examination under a microscope by a pathologist. To do this the doctor may perform a peritoneoscopy. To obtain tissue for examination, the doctor makes a small opening in the abdomen and inserts a special instrument called a peritoneoscope into the abdominal cavity. If these procedures do not yield enough tissue, more extensive diagnostic surgery may be necessary. If the diagnosis is mesothelioma, the doctor will want to learn the stage (or extent) of the disease. Staging involves more tests in a careful attempt to find out whether the cancer has spread and, if so, to which parts of the body. Knowing the stage of the disease helps the doctor plan treatment. MPM is described as localized if the cancer is found only on the membrane surface where it originated. It is classified as advanced if it has spread beyond the original membrane surface to other parts of the body, such as the lymph nodes, or abdominal organs. Surgery is a common treatment for mesothelioma. The doctor may remove part of the lining of the abdomen and some of the tissue around it. Chemotherapy is the use of anticancer drugs to kill cancer cells throughout the body. Most drugs used to treat mesothelioma are given by injection into a vein (intravenous, or IV). Doctors are also studying the effectiveness of putting chemotherapy directly into the abdomen (intracavitary chemotherapy). To relieve symptoms and control pain, the doctor may use a needle or a thin tube to drain fluid (effusions) that has built up in the abdomen. Removal of fluid from the abdomen is called paracentesis. Radiation therapy and surgery may also be helpful in relieving symptoms. Because malignant peritoneal mesothelioma is hard to control, the National Cancer Institute is sponsoring 14 clinical trials (research studies with people) that are designed to find new treatments and better ways to use current treatments. Before any new treatment can be recommended for general use, doctors conduct clinical trials to find out whether the treatment is safe for patients and effective against the disease. Clinical trials are an important treatment option for many patients with peritoneal mesothelioma. One example of a new approach is a drug called Veglin being studied by Dr. Gill at the USC/Norris Comprehensive Cancer Center. Veglin is one of several newly developed non-chemotherapy drugs being tested in the ongoing struggle to combat malignant mesothelioma. It is an anti-angiogenesis agent that works by cutting off the blood supply the cancer needs in order to grow. A phase I trial has already been completed and a phase II trial is underway. More information on Veglin and the trial can be found at http://www.mesorfa.org/treatments/veglin.php . Patients interested in taking part in a clinical trial should talk with their doctor.